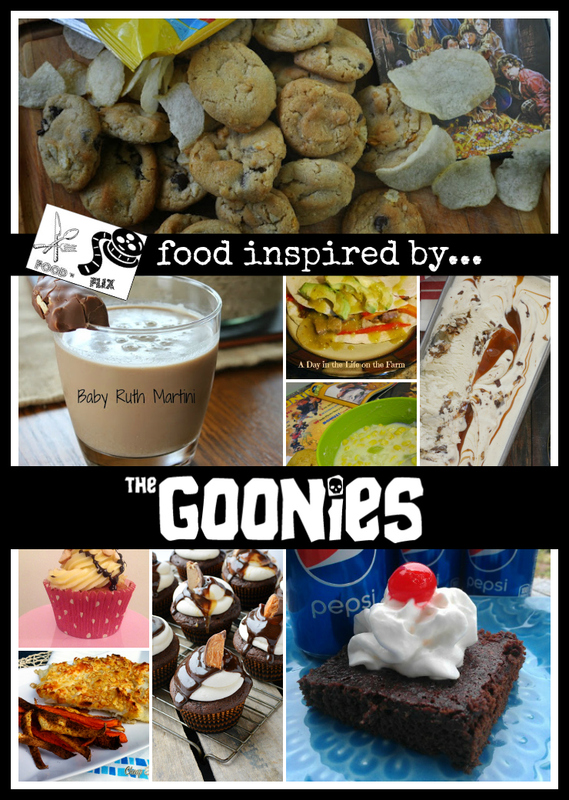 This month I hosted Food 'n Flix with my pick of movies, The Goonies. 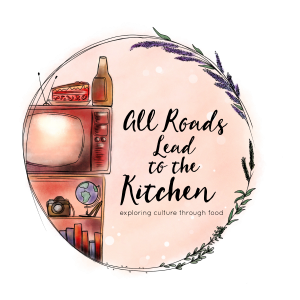 Though not your typical "foodie movie", if you're paying attention, you can find plenty of food references and inspiration from the first scene to the last. 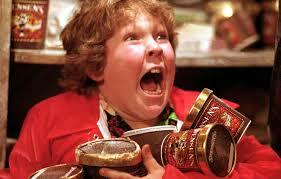 I grew up watching The Goonies. It's been one of my favorite movies since I was 10. I actually thought that everybody loved The Goonies. Apparently, I was wrong. 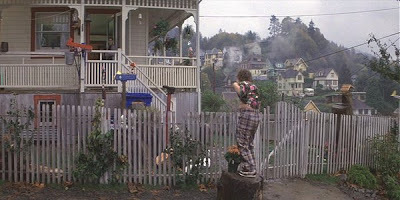 Is it weird that it kind of makes me sad that some people don't love The Goonies? 'Cause it does. I'm sure the non-Goonies are rolling their eyes at me right now. That's okay. 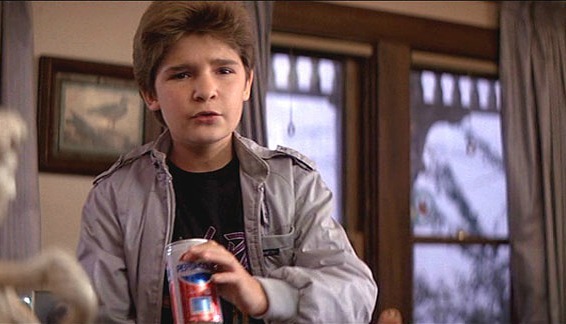 I'd pick Brand over Troy any day of the week (aka I'm not ashamed to be a Goonie-lover). That being said, deep down I know that not everybody enjoys the same things (and wouldn't it be boring if we did), and I'm just happy that even though some people can't relate to that Goonie state of mind—they can relate to food. They can also be a good sport about me choosing The Goonies this month and still play along. That's enough to make this Goonie happy. Let's start this roundup with a couple of submissions inspired by the POTATO CHIPS! Debbie from The Friday Friends made a batch of scrumptious Chocolate Crunchies, aka cookies with salty, crunchy potato chips baked right inside. I'm pretty sure Chunk would've been all over these (I know I am)! Evelyne from Cheap Ethnic Eatz also chose potato chips as her inspiration in this Crisps Fish and Veggie Chips, an updated version of fish and chips. 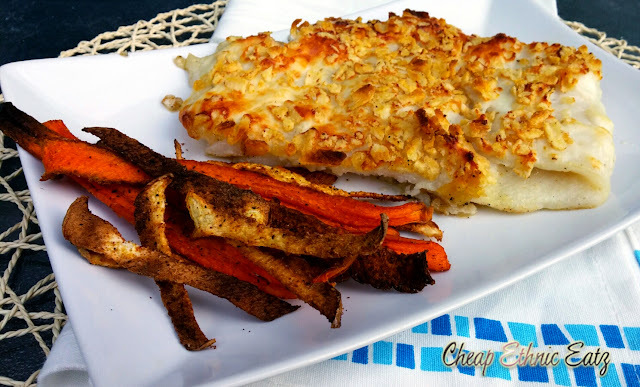 She coated her fish in a light batter and crushed potato chips! 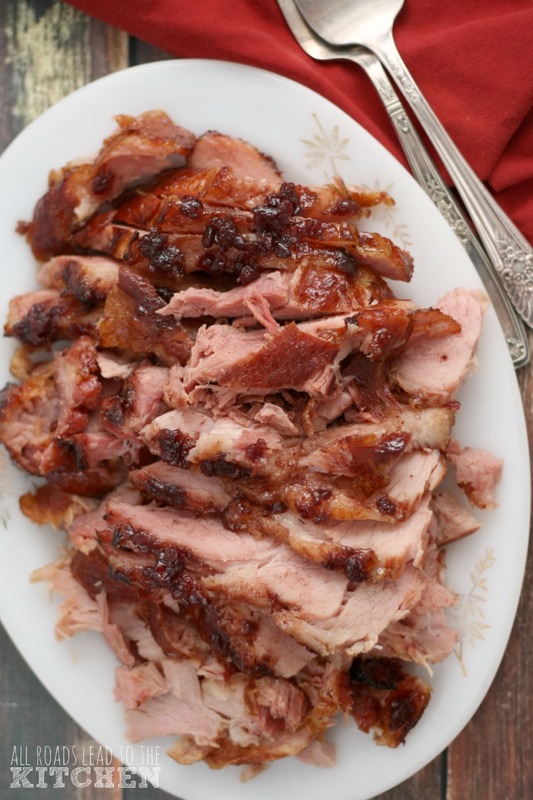 Now let's move on to a dish inspired by the PEPSI we saw advertised so often in the movie! 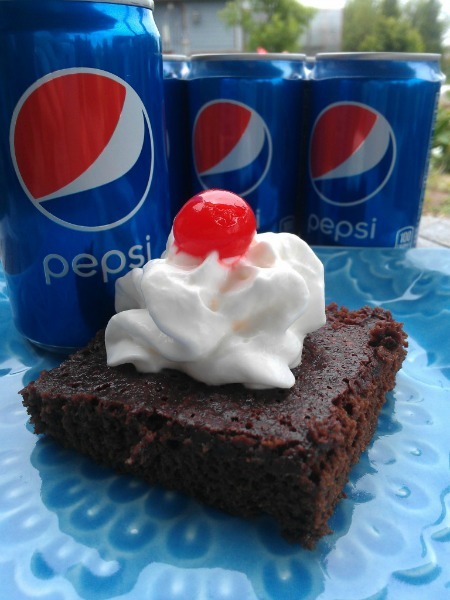 Debra from Eliot's Eats drew inspiration from the product placement in The Goonies and made a batch of Pepsi Brownies that we're all sure Chunk wouldn't be able to resist. I'm thinking some of that canned whipped cream they were spraying in their mouths would be great on top of one of these, too! Color me really happy that somebody used the TONGUE scene as inspiration! Yes, somebody went there! 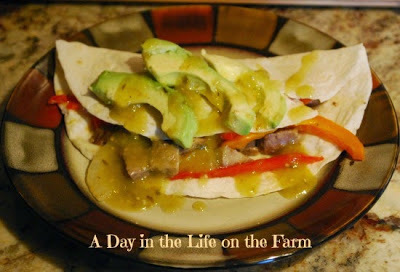 But hey, I'm pretty sure that even the boys wouldn't mind diving into these amazing Lengua Tacos that Wendy from A Day in the Life on the Farm brought to the table. And now for something a little obscure...inspiration from the WALSH'S HOUSE!? Oh yeah, I said it - their house. Leave it to Kimberly from Coffee and Casseroles to draw inspiration from the corn decoration she noticed on the house to make a bowl of "Chunky" Corn Chowder and Biscuits (shaped like Sloth's head, you might notice)! Love the way this girl thinks. Who doesn't get a craving for a slice of PIZZA at least once during the many references throughout the film? Ree from Route to Delicious thinks Chunks deserves a pizza after all he went through, so she shared Pizza Montanara Strarita (or Chunk's New Favorite). On a separate note - welcome back Ree (Ree was my original partner-in-crime over at the Food 'n Flix website almost 5 years ago)! 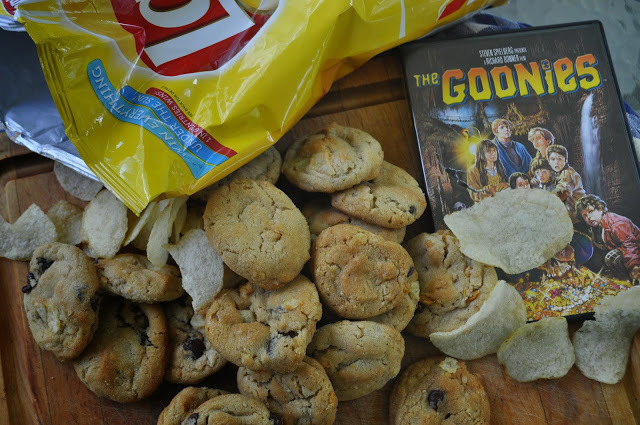 What would a roundup of Goonies-inspired food be without a little BABY RUTH? 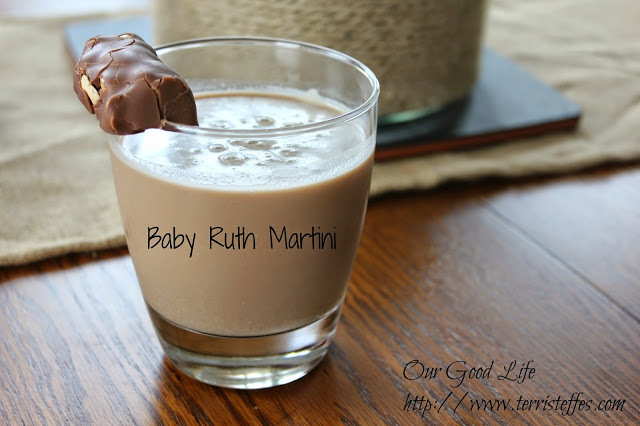 Inspired by Sloth only really wanting a candy bar and a friend, first time Food 'n Flix participant Terri from Our Good Life brought a tempting Baby Ruth Martini this month. 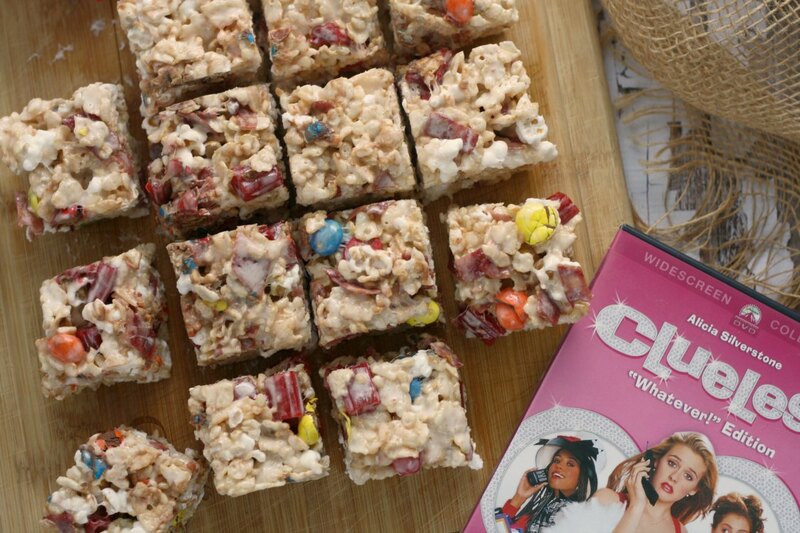 A boozy candy bar? Yes, please! Amy from Amy's Cooking Adventures went with the whole "kid food" theme of the movie and made a fun batch of Candy Bar Cupcakes! Did I mention they're both topped AND stuffed with a candy bar? Speaking of cupcakes, feast your eyes on these Goonies-inspired Baby Ruth Cupcakes from Caroline of Caroline Makes. 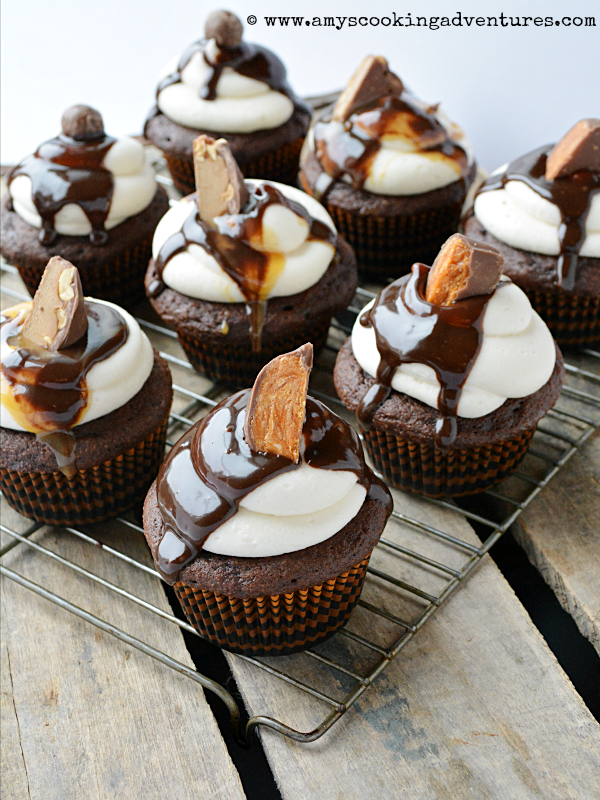 The cakes combine the flavor of a Baby Ruth candy bar with a nougat center, salted caramel buttercream and are topped off with chopped nuts and chocolate. Wowza! 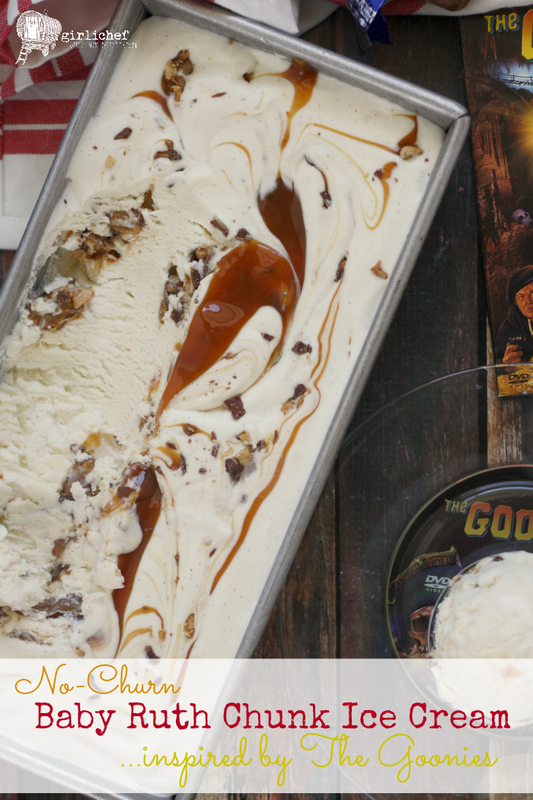 Last but not least, a little something inspired by both the Baby Ruth scene and the ICE CREAM lovin'. Last up was my No-Churn Baby Ruth Chunk Ice Cream. I used both the Baby Ruth scenes and the fun ice cream scenes as my inspiration for this creamy vanilla bean ice cream that's swirled with ribbons of caramel and studded with "chunks" (get it...CHUNKS!) 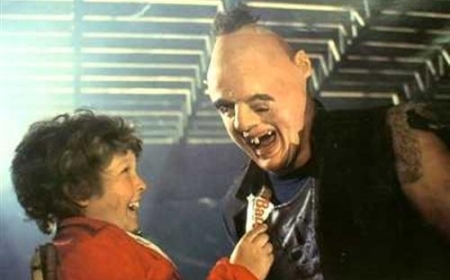 of Baby Ruth. 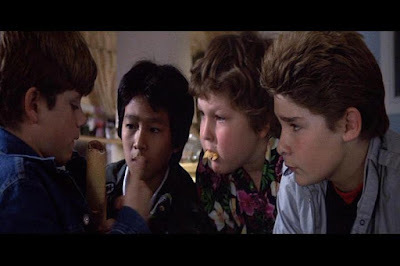 I had so much fun reading through everybody's posts and hearing what parts of The Goonies inspired them to head into the kitchen! Wondering who did like the movie, and who didn't? You'd never guess by looking at these awesome submissions, would you? You'll have to click through to each person's post if you really want to find out. 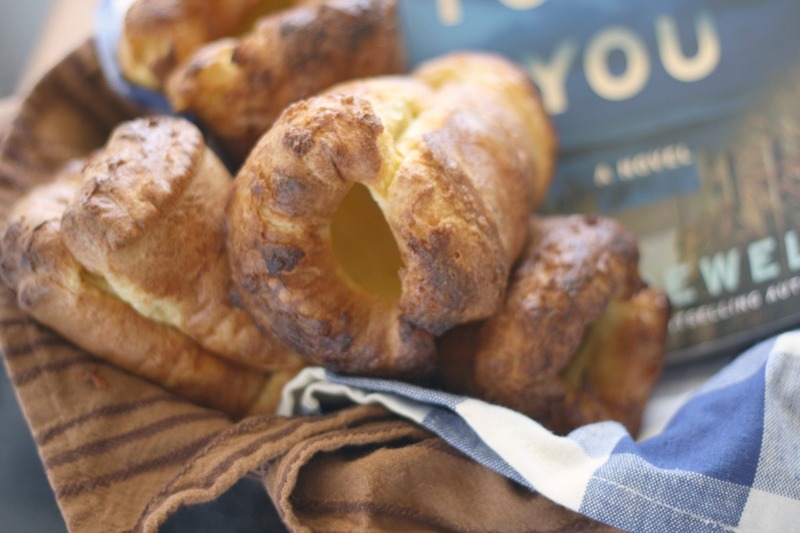 Thanks so much to everybody who participated in the May '15 edition of Food 'n Flix—those who love it, and those who were great sports and cooked along, even though they weren't a fan. One of the things I love most about the Food 'n Flix club is the fact that not every person enjoys every film...but they always come up with something delicious or clever (or both) in the kitchen! 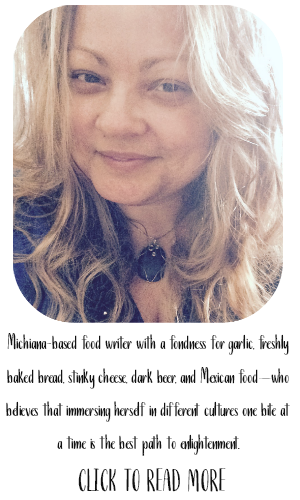 Next month's Food 'n Flix host is Evelyne from Cheap Ethnic Eatz, and she has chosen the flick Butter. I hope you'll join us! 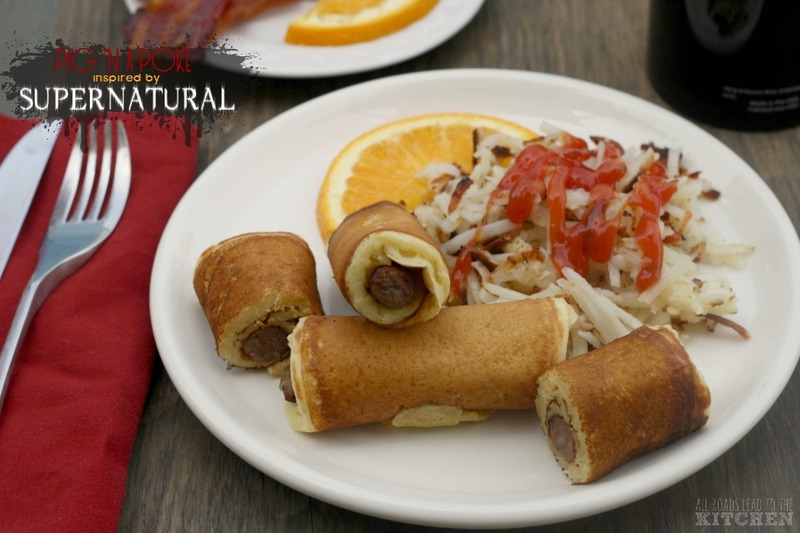 See more movie-inspired food on my Food 'n Flix Pinterest board!